The Casio G-Shock Analog G-Steel Series Watch feature a stainless steel forged bezel with a knurled surface for a tough and rugged look. 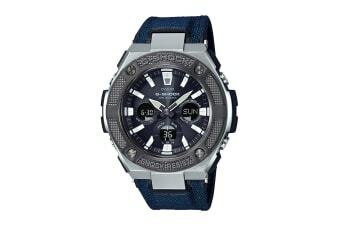 The band of the Casio G-Shock Analog G-Steel Series Watch combines highly wear resistant tough leather with CORDURA fabric, which is stronger than nylon and often used for heavy-duty work wear. The overall tough and rugged designs are also supplemented by the high shock resistance of this watch. The bezel and band designs add to the G-STEEL functional elegance and make this watch universally suitable for wear with a wide range of casual fashions. Other features include Tough Solar powered operation and hand shifting, as well as Neon Illuminator for the analog face and a white LED backlight for optimal readability.